There’s cute, trendy, easy to layer jewellery – and then there’s West Coast by Sara jewellery. Designed for those who are independent and naturally fierce, elements like horns and evil eyes are just some of what sets this unique brand apart. Founded in 2017 by Sara Elzayat, the brand began as a way to fulfill the designer’s entrepreneurial notions. After great feedback from her first customers, who demanded she make more of her unique creations, Sara went full time into her endeavour, giving West Coast by Sara the energy it needed to reach its full potential. And, that potential just keeps on growing. Endlessly inspired by the world around her, from the beauty of the women she meets to the mystique of the foreign cities she visits, Sara’s collections seem to happen effortlessly, a sign of a true artist who has found her calling. Crafting her pieces by hand, there’s a uniqueness to each design, something that is simultaneously abstract yet totally relatable. The latest West Coast by Sara Collection, ENERGIA, was inspired by Sara’s summer in Egypt. There, she was captivated by the evil eyes and beautiful beach blues she saw on stylish women. 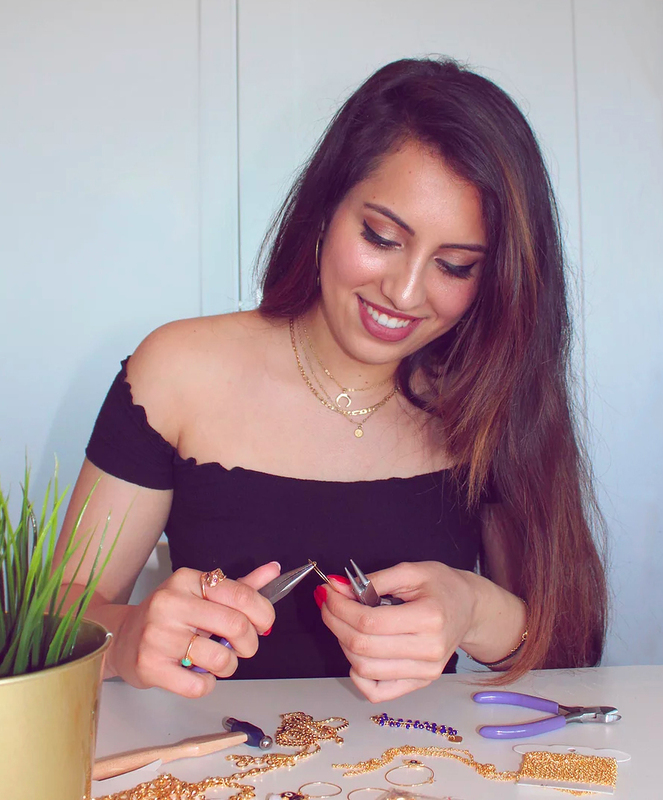 Upon returning home, she got to work, setting out to create a stunning array of earrings, necklaces, and bracelets, all infused with that fierce, global vibe. And, because choosing just one from the lineup is nearly impossible, you can purchase the full ENERGIA collection, which includes the evil eye and blue elephant hoops, a bracelet, and the matching evil eye and elephant necklace. Wearing the entire collection together, as you might imagine, gives you a super stylish everyday look that is refined and polished. 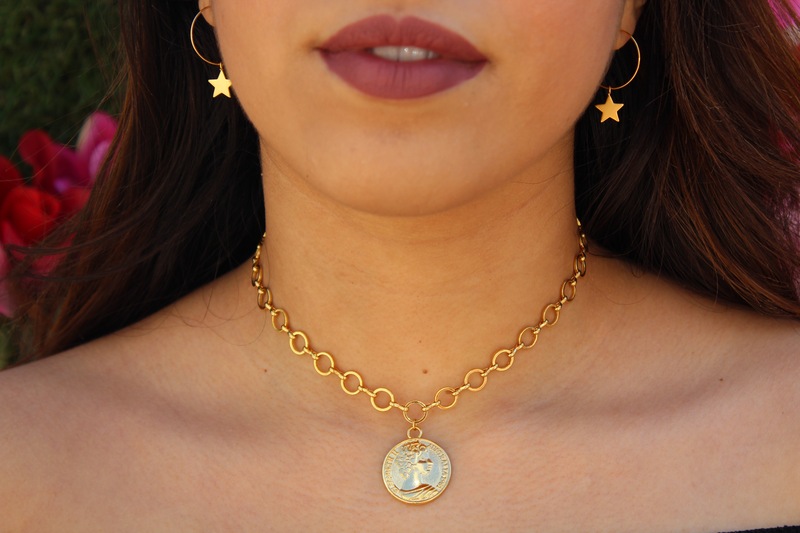 The Kallie Gold Coin Choker is another attention-getter, a bold statement necklace that’s right on trend along with the most en vogue accessories. As are the Gold Hoops with Dangly Stars Earrings, which are every bit as fierce as they are fun. The Gold GIRLS Diamond Choker, however, might just be our summer’s must-have piece as it’s the perfect balance between cheeky, sparkly and go-with-everything we’re always looking for. A former pre-law student at the University of Toronto, Sara seems to have made the right career decision by launching herself into the fashion world. Perhaps it’s that lawyer-like determination, though, that leaves her unfazed by the roadblocks that deter so many promising designers. And, she’s not done yet. Although she’s continuing to focus on her jewellery, the young designer promises that there’s much more to come, including clothing that will “fashionable, on-trend, and easy to wear and style.” Ok Sara, we’re ready!